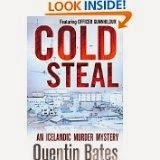 I’ve been a fan of Quentin Bates’s Icelandic mysteries since the first one, Frozen Out, came out in 2011. His latest, Cold Steal, was published on 1 May so this seemed an ideal time to interview him for the blog. I began by asking him to tell us a little bit about his new novel. Without giving too much away, it involves some of Reykjavík’s immigrant community and some of its criminals, both local and imported varieties. A businessman is murdered in the country cottage he keeps for getting to know his secretary better and as a murder is rare in Iceland, a full scale investigation starts, with Gunnhildur tasked with investigating the dead man’s murky business affairs. With everyone busy on this enquiry, the hunt for a particularly skilled housebreaker who never leaves clues is shelved, although the burglar carries on with his activities and one night gets the shock of his life when he breaks into the wrong house. Of course it all links together before Gunnhildur gets to the bottom of it. This can be a problem, as a I have a day job that’s also writing. It has taken a while to get used to it, but I’ve had to get used to working in shorter bursts of a couple of hours at a time instead of the longer stretches that I prefer but can’t find much opportunity for. Half a day, or more, is great but doesn’t happen often. I actually do most of my day job work in the shed and other stuff at the kitchen table. So moving from day job mode to fiction mode means unplugging the laptop and carrying it upstairs. What comes first for you. a theme, plot, characters? Characters, I think. With Cold Steal it was certainly the characters of the three immigrant women, the Reindeer Cleaners, who started the ball rolling. Then there was the solitary burglar who became quite a fascinating character to write, with a peculiar set of skewed values all of his own. Writing the criminals is becoming more interesting than the regular characters and I was at least a third of the way into writing Cold Steal before Gunnhildur even made an appearance. Gunnhildur Gísladóttir is a beguiling heroine. How did she come into being and does she have a real-life counterpart? That would be telling, I’m afraid. She is an amalgam of a whole group of people, with aspects of her from all over, plus a large dollop of imagination. To begin with in the first draft of the first book she was the sidekick of the original male protagonist. He didn’t last long as I figured out that he was too many clichés rolled into one, while his sidekick was a far more interesting character, so he was rapidly retired and Gunnhildur was promoted to centre stage. Her name comes partly from my late mother-in-law, Hildigunnur, who died many years ago and far too young. Although we had plenty of disagreements, I was very fond of her. So I switched around the two halves of her name for my rotund heroine and there’s undoubtedly an element of the old lady in Gunnhildur’s character. There are so many and they tend to change all the time, but the ones I keep coming back to are Sjöwall & Wahlöö and Simenon. Sjöwall & Wahlöö were the forerunners of Nordic crime fiction and in spite of all the excellent stuff that has followed, I don’t feel they have ever been bettered. I have a liking for Simenon, and Maigret in particular, that goes back a very long way. His stories are straightforward, very character-based and they conjure up atmosphere beautifully in a few words, although the translations vary in quality. What’s noticeable is that his stories work effortlessly, and without any gimmicks or twists. Other favourites are Dominique Manotti (why are there so few of her outstandingly excellent books in English? ), Edward Wilson, Donald Westlake, Belinda Bauer and John le Carré. But there are many more, although normally if I’m scanning a shelf of books I’ll go for something I’ve never heard of rather than something familiar and comfortable. A man after my own heart! Do you have a favourite bookshop? That’s a sore point these days. There used to be a couple of very decent bookshops near where I live in England, but online shopping killed them both off. Now I have to travel a few miles to get to the nearest Blackwells, run by the excellent @booksellerjo. So the bookshop I always head for is the one run by Bragi Kristjónsson on Hverfisgata in Reykjavík. It’s called Bókin (the Book) but referred to by everyone as Bókabúð Braga (Bragi’s Bookshop). It’s a second-hand shop and a chaotic wonderland of the weird, the wonderful and the mundane all rolled into one, plus the old chap himself behind the counter taking snuff and telling stories, not that he’s there as often as he used to be. Then there are the bookstalls in the Kolaport flea market that are always good for a browse for something obscure in English or Icelandic that’s been out of print for decades. There is more about Quentin and his books at his website: Graskeggur.com. And we’ll both be at Crimefest in Bristol from 15-18 May if you want to meet us there: crimefest.com. And great to read more about a series I really enjoy. Lovely to hear from you, Dorte. I’ll be thinking of you and your husband at this year’s Crimefest.